New Caledonia: A Botanical Land of the Lost? Why is New Caledonia home to so many ancient plant families and relatively sparse in modern plant families? Until fairly recently, New Caledonia was thought of as a kind of botanical “land of the lost,” a piece of Gondwanaland that drifted into a climate warm enough and wet enough to preserve its dinosaur-age flora. Gondwana was one of the two ancient supercontinents produced by the first split of the even larger supercontinent Pangaea about 200 million years ago. 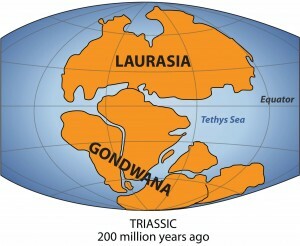 Gondwana was comprised of what are now Africa, South America, Australia, Antarctica, and the Indian subcontinent. When these modern continents were joined in the super-continent Gondwana, the environment was mild, wet and lushly forested — even the area that would one day be Antarctica. If you could go back in time and take a hike in Gondwanaland, what would you see? Mosses, lycopods, giant horsetails, ferns, tree ferns, conifers and cycads would be the most common plants. Since these plants have descendants alive today, they would have a familiar appearance, only, in many cases, on a much larger scale. However, flowering plants (angiosperms) had yet to explode on the scene, so you would not see any plant with the petaled blossoms most commonly associated with flowering plants. A word of caution: The time-traveling hiker would want to step carefully because, in addition to outsized plants, Gondwana was home to some of the biggest dinosaurs that ever lived, including the Giganotosaurus. Life on Gondwana began to change as the supercontinent broke apart and drifted. Australia separated from Antarctica 50 million years ago. As Australia drifted away from the southern polar region, its climate became warmer and drier and new species of plants and animals evolved and came to dominate the landscape. The separation of South America from Antarctica 30-35 million years ago allowed the Antarctic Circumpolar Current to form, which isolated Antarctica climatically and caused it to become much colder. Some isolated remnants of the ancient Gondwanan forests remain in Australia. These include the cool and warm temperate rainforests of Tasmania and eastern Australia and the dry rainforests or scrub forests of northern Australia. Plants of Gondwanan origin are also important components of the southern Neotropic (South America). The story of Gondwana’s separation is, in part, the story of how so many closely related plants came to have very distant distribution. For instance, you will find Araucaria in Chile, Australia, and Papua New Guinea. The plant lineages of Gondwanan origin are also called Antarctic Flora. New Caledonia’s fate in this geological history is tied to the continent of Zealandia, which drifted northeastwards from Gondwana in the late Cretaceous (around 80 Ma ago) and reached its current position in the Eocene, approximately 55 Ma ago. Zealandia is a largely submerged continental plate, but it was thought that New Caledonia stayed above the waters of the Pacific, carrying with it a bit of Gondwana’s flora. If so, the island ark was fortunate in the direction of its drift; on a northeasterly heading, it reached its current tropical location. The archipelago’s isolation and the relative stability of its climate would have ensured the preservation of its ancient flora, including many species that have gone extinct or radically evolved in more inhospitable climates. The original flora would have gradually increased in richness over the millions of years since separating from Gondwana. However, Gondwana’s ark sank. And for a long time. Like other ostensible “lost worlds,” New Caledonia appears to harbor life of more recent origin. Geological evidence indicates that the ridge on which New Caledonia rests was completely submerged during the Palaeocene until the Late Eocene, a span of about 20 million years. In fact, Grande Terre, the main island, was not only underwater, it was largely overlayed by oceanic crust, which left behind the ultramafic rocks that still occupy a third of the island’s surface. More evidence is stacking up all the time, thanks to molecular phylogenetic studies (looking at DNA to see how different species or populations within species are related). New Caledoia isn’t an ark, therefore. But then, where did this remote island’s unusual flora come from? How can there be so many species of Araucaria, Podocarpus and other Antarctic lineages that exist nowhere else? The ascendant explanation for New Caledonia’s rich diversity of Gondwanan lineages is that it is a Darwinian island and not a surviving fragment of Gondwana. A fragment island is a detached portion of a continental landmass. The closer the island is to the source continent, the greater the exchange between their biota. If the fragment island becomes isolated over a long period of time, some of the species present may go extinct on the mainland, while they still remain on the fragment. These are called paleo-endemics or relicts, and given isolation and time they can diversify into lineages of their own. New Caledonia was thought of as a very remote continental fragment that separated from its continent 60 million years ago. 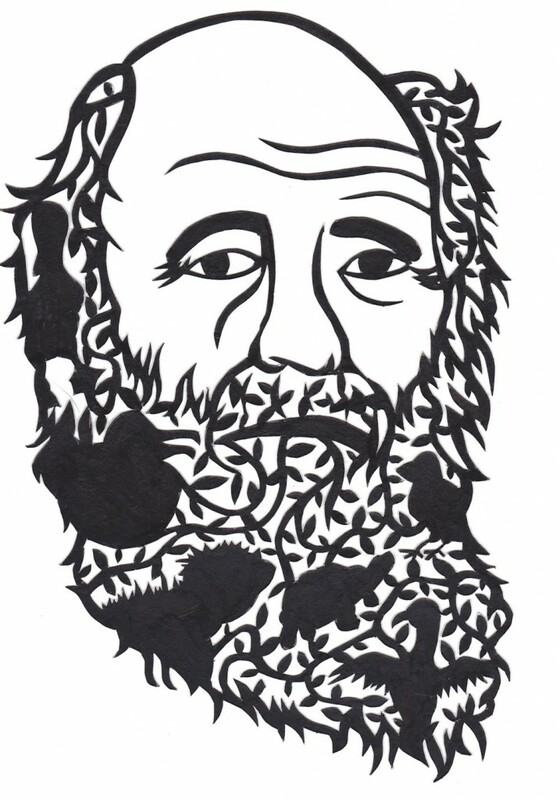 Darwin cut-out by Tawnya Mendonsa. Galapagos-shaped beard with creatures from islands. Because New Caledonia was very probably submerged for 20 million years and re-emerged between 33 and 38 million years ago — wiped clean of its original biota — it is more of a Darwinian island. Some islands, as Charles Darwin first observed, were never in contact with the land that is the source of their biota. These islands are initially empty, and the plants and animals that eventually populate it have immigrated – traveling a long distance to remote islands. As Darwin showed with the Galapagos, time and isolation yield speciation through adaptive radiation, the process by which organisms diversify into a multitude of new forms as they fill available environmental niches. So, when New Caledonia re-emerged it was re-colonized by plants and animals through long-distance dispersal, probably from Australia, New Zealand, and Papua New Guinea. The processes of speciation and adaptive radiation were likely aided by the fact that the environmental niches on the island are quite varied (given the diversity of terrain, climate and soil conditions) and were initially unoccupied. So, New Caledonia is not like a living-backdrop to a dinosaur diorama. It is not a Gondwanan “land of the lost” in the sense of being a preserve of the direct descendants of plant species found on Gondwana before its break-up. Rather, New Caledonia’s rich flora is descended from species that had many millions of years adapt to climates very different than Gondwana’s before finding their way to a land transformed by its time beneath the sea. The island’s flora can still fire the imagination. You just need to look through a different lens, something like the lens through which Darwin viewed the Galapagos. Espeland, Marianne and Jérôme Murienne. (2011) “Diversity dynamics in New Caledonia: towards the end of the museum model?” BMC Evolutionary Biology 2011, 11:254. —, Diversification on an ancient Darwinian island: Evolutionary history of caddisflies (Trichoptera) and other organisms on New Caledonia. Diss. Zoological Institute, Stockholm University, 2010. Grandcolas, Philippe, et al. (2008) “New Caledonia: a very old Darwinian island?” Philosophical Transactions of the Royal Society of Biological Sciences. 27 October 2008 vol. 363 no. 1508 3309-3317. Pelletier, B. (2006) “Geology of the New Caledonia region and its implications for the study of New Caledonian biodiversity.” Compendium of marine species of New Caledonia, Documents Scientifiques et Techniques IRD, II 7 pp. 17-30. Nouméa, France, Institut de Recherche pour le Développement.